In a near carbon copy of the 1996 season finale, Tampa Bay built an early first-half lead thanks in part to an outstanding special teams play, then used a strong running game to finish up a rout of the Bears. The running game produced 183 yards, including 153 in the second half, largely on the legs of Warrick Dunn. On the final play of the opening period, Karl Williams turned in perhaps the most exciting special teams play in team history, weaving and spinning out of multiple tackles to record a 61-yard punt return touchdown. It was the second punt return TD of Williams’ career and only the third in team history. INDIVIDUAL STATISTICS RUSHING BUCS: Dunn 16-119, Anthony 1-23, Rhett 6-20, Alstott 5-12, Dilfer 1- 7, Ellison 1-5, Walsh 3-(-3). BEARS: Autry 16-45, Carter 2-25, Hicks 2-9, Mirer 4-6, Harmon 2-6, Kramer 1-(-1). PASSING BUCS: Dilfer 18-10-94-0-1, Walsh 1-1-0-0-0. BEARS: Kramer 19-12-82-1-0, Mirer 10-6-39-1-0. 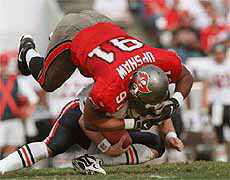 RECEIVING BUCS: Williams 4-47, Dunn 3-18, Davis 1-16, Anthony 1-8, Alstott 1-5, Jordan 1-0. BEARS: Proehl 4-41, Conway 2-18, Wetnight 2-15, Engram 2-12, Carter 2-9, Harmon 2-8, Autry 2-4, Allen 1-9, Allred 1-5. INTERCEPTIONS BUCS: Johnson 1-19, Abraham 1-0. BEARS: none. KICK RETURNS BUCS: Anthony 3-90. BEARS: Smith 6-119. PUNT RETURNS BUCS: Williams 6-116. BEARS: Proehl 4-30. SACKS BUCS: Sapp 2-6, Upshaw 1-2. BEARS: Mangum 1-8.